I usually hold off on these until the character has been properly introduced to either the US or UK (usually the latter since it's my home country) market. But this one annoyed me so much that as soon as I watched the UK dub via a Japanese source and YouTube uploads, I had to make a character analysis of Hugo now. So here it is. Out of all the characters released over the years, there are three that are generally considered annoying by the fans: Bash, Dash and Ferdinand. Literally just a watered down attempt at recreating the dynamic Edward, Bill and Ben once had, it simply didn't work because of how one note and stupid they were. Other characters have been labelled annoying by certain sets of fans; Samson and Philip being the prime examples. But at least they have a strong enough reason as to why they'd act that way: Samson is proud and stubborn while Philip is a child. I would argue, however, that Hugo is the most annoying character ever conceived. Whether or not there's a historical reason as to why the engines were being bullies towards him is up for debate (he is an oddity, but why the hell is Edward so cruel/worried about so many newbies?! First Harvey, then Rocky, now Hugo? This just isn't Edward, no matter what you say), but the fact that the main characters, who should probably realise that nothing can replace them at this point, so cruel?! There needs to be someone who's likeable, and doesn't just change their opinion on the flip of a coin because the plot demanded that happen! Even Percy, who actually ended up helping, was subtly antagonising him. But I'm getting sidetracked. 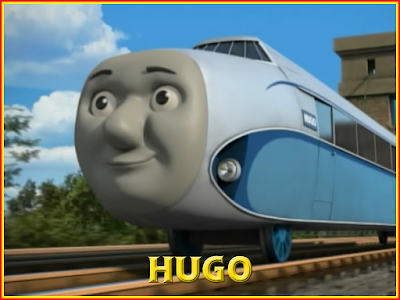 My main problem with Hugo's episodes - both of them - is the fact that he's the most pitiful, pathetic character that I've ever seen. I've said before that I didn't like Hiro's whinging back in the day, but at least he had a bloody reason to moan! What does Hugo have to cry about? And what exactly does he do to prove his worth to the railway? The answer to both of those questions is "nothing". He has no reason to complain whatsoever: he can carry passengers easily and he was, at one point, the fastest thing running on rails. Accentuate the positives! Maybe have him be humble when people point out his achievements. Maybe pair him with Daisy; they could've been brilliant together (and if you had her break down, Hugo would actually have had a reason to be on Sodor other than "we need another character to make merchandise from". For God's sake, you managed to create a brilliant story about glow in the dark paint, but not with a unique looking character like Hugo?!)! But no. They just had to go down the "be happy with who you are" message that even kids are probably sick of by this point as it's being taught so often! All I kept thinking throughout his two episodes (in which, by the way, he was introduced at the beginning of each one) was "Jesus Christ, just grow up!". I'm sick of those who expect pity parties solely because they're a bit different, whether in fiction or reality. That's not to say that there aren't things I'd love to do but can't due to what I have, but I'm not exactly moping about the fact that I can't do that stuff. Because there's a lot that I can do, I have a great circle of friends and I'm having a blast. Life's too short to bemoan what you can't do, and if Hugo actually learned this, rather than the typical "be who you are", he would've actually had a point. But overall, he doesn't. You can see how little they cared about him as he was there... just because. Maybe it's something to do with the Earl, but this is something you need to make clear from the first episode they're in! Imagine Glynn's story if he'd been restored in The Christmas Coffeepot only to realise he's inexplicably working on the main line next episode. There's no sense of pacing or proper narrative reasoning to Hugo's story, and when you couple that to the absolutely diabolical character he was given, I can only rate him as one of the worst in the show's history. Yeah, I don't really see what point Hugo has either; if he never appeared again, I could care less. His personality is generic, and his design, however cool it may look to some, was rubbish in reality.